These are also called Viennese Rolls, but literally translate from the French as "Milk Rolls". They are traditionally made like a brioche, with less butter and a higher amount of liquid, milk instead of water, hence the name. 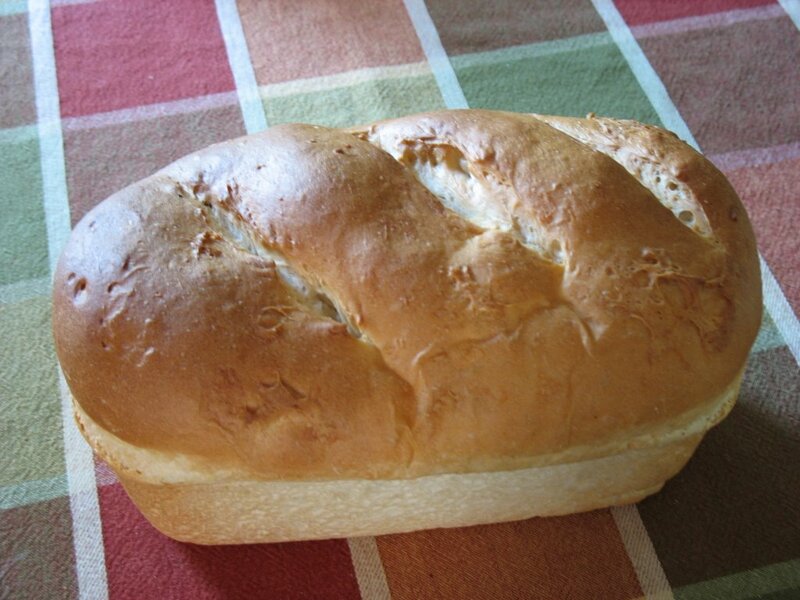 You can go for regular old milk, but I chose almond milk this time and it added a nice softness to the bread. You could use orange blossom water or a touch of orange juice to perk it up, instead of the almond milk. 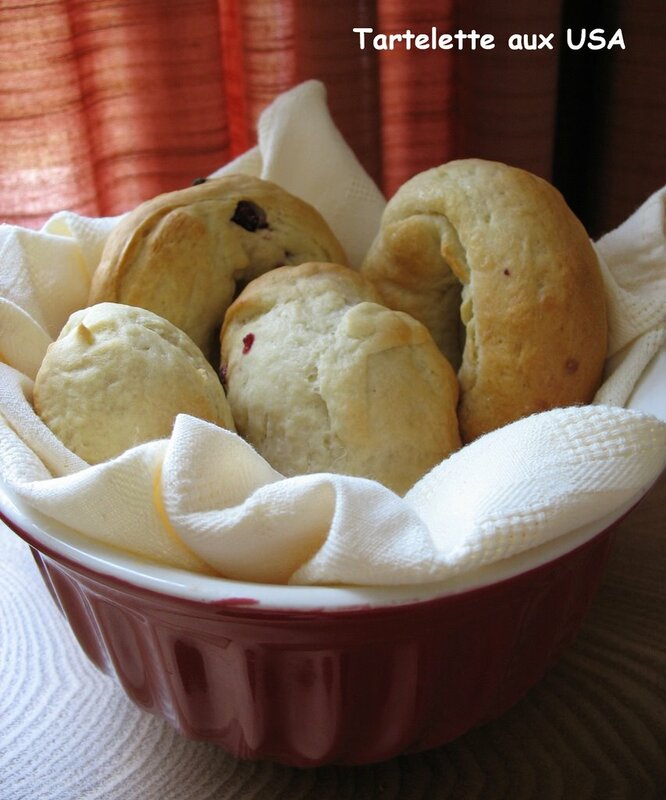 I added dried raspberries, but you could use chocolate chips, or again...leave them plain. They are traditionally of oval shape, but you can make rolls or pretend they are palying bagels...! They are awesome served warm for breakfast or toasted for foie gras and pates. Recipe to come later on today...I am beat. When I was growing up my grandmother used to make this tart with a very nice shortbread crust, jam at the bottom and covered with a nice cream sometimes flavored with almonds, sometimes not. 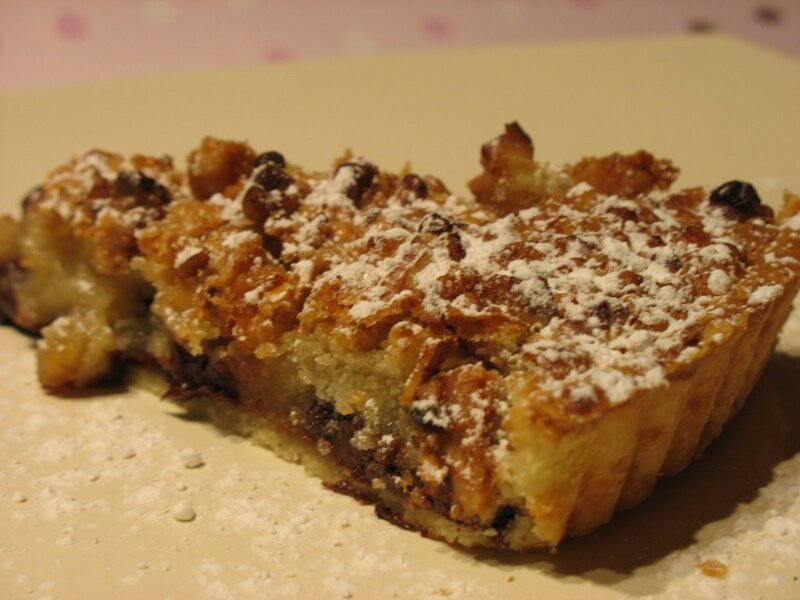 The other day I was perousing the various foodie events for June and the words Bakewell Tart made me raise an eyelid: what was that? 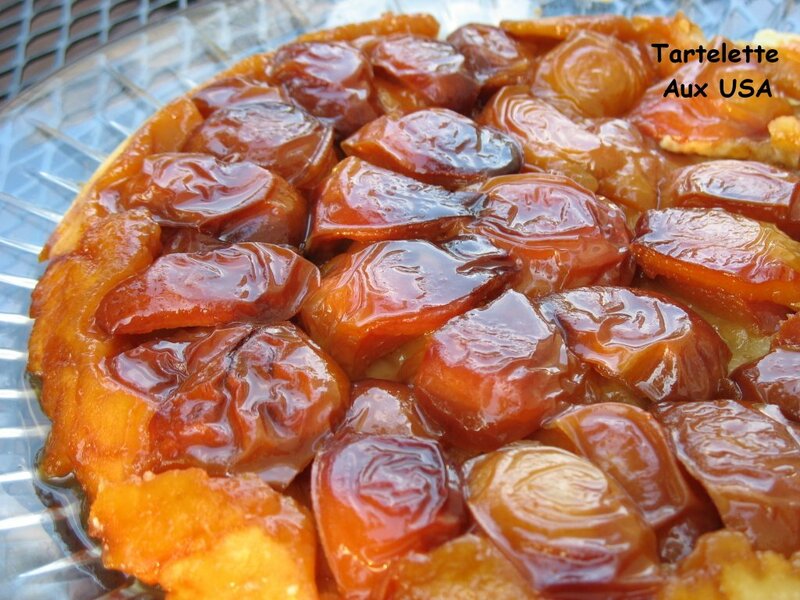 A tart I did not know existed? There I was checking Andrew's site to get more details about it and decided to go online and try to find a recipe. Dang! It was my grandma's tart! or should I say Grandma borrowed it from the English?! I love this tart but I never really saw her follow a recipe nor did she leave me with one. After looking at about 5 or 6 recipes online I kind of understood that even without the exact same ingredient amounts the concept of the bakewell Tart is the same: a shortbread crust, a layer of jam and an almond flavored cream. I used the one found here but modified it like so: I doubled the amount for the filling part, added a good handful of toasted and ground almonds and used homemade nectarine and rhubarb jam instead of a berry one, most commonly found in the Bakewell Tart. Method- Sift the flour and salt into a large mixing bowl.- Add the lard and the butter and chop it up roughly with a knife.- With cool fingertips, rub the fat into the flour until the mixture resembles breadcrumbs.- Add 2 tablespoons of cold water and then, using a knife, mix lightly into a dough.- Add a little more water if necessary but be careful not to add too much.- The dough should not be sticky.- Gently bring the dough into a ball by hand, gathering up any stray bits of dough.- Leave to rest in the fridge for a couple of hours before using.- To use, roll lightly with a rolling pin on a lightly floured surface. Method- Line an ovenproof dish with the rolled out pastry.- Spread some strawberry jam on the pastry base.- Cream the sugar and butter together.- Add the egg, flour and baking powder, beating until smooth.- Beat in the essence.- Pour the mixture into the pastry case over the jam and bake in a hot oven until the pastry is cooked and the filling is firm to the touch. It's really good, very easy to put together and most pleasing to everybody, great for all season if you want my opinion. Note: I now it looks like the bottom crust is not cooked through and you would be right but there is a reason for it: the Cookie Monster likes his pie crust like his cookie dough: undercooked...yikes! I usually finish baking my slice separately. Yes...this is what I have just eaten as I got back from work but it is also the title of a blog I have come to visit everyday. JenJen at Milk and Cookies never ceases to tempt me with cookie creations and since I live with the Cookie Monster I need more than the traditional chocolate chip or oatmeal varieties to keep this household straight. Since she posted about Jaime Oliver's Orange and Polenta Biscuits, the demand has been high for a recipe and she finally caved in the other day. Thank you! I foolowed her recipe but my first batch did not spread in the oven, and I ended up smashing the little thing down with the back of a spoon. The flavors are just right, they are nice and crispy and great dunked in tea. Preheat oven to 190C. 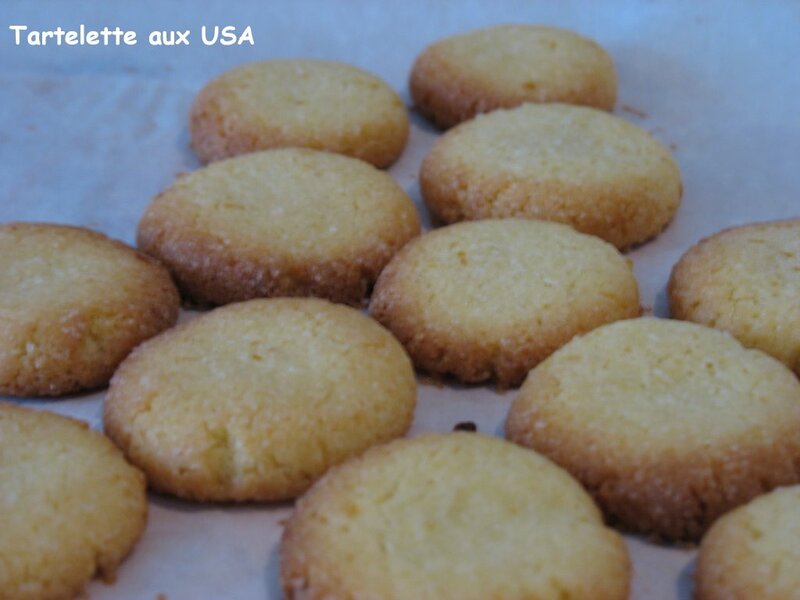 Combine butter, sugar, polenta and flour in a bowl and rub them together until the mixture becomes crumbly. Mix in the orange zest and two eggs and beat until well incorporated.If necessary, cover the dough in plastic wrap and place in the fridge until slightly firm. Take a portion of dough and roll it into a ball and place on a baking sheet lined with parchment paper. Space the balls approximately 5 cm apart, as the biscuits will spread upon baking.Bake in the oven for 6-10 minutes, or until the outside edges are lightly golden brown. Remove from oven and allow to cool on a wire rack. (Hers)NOTE: I found that there was no need to refrigerate the dough as I was baking these on a very cold day and the dough was firm enough. This step is optional, depending on the temperature in your kitchen. 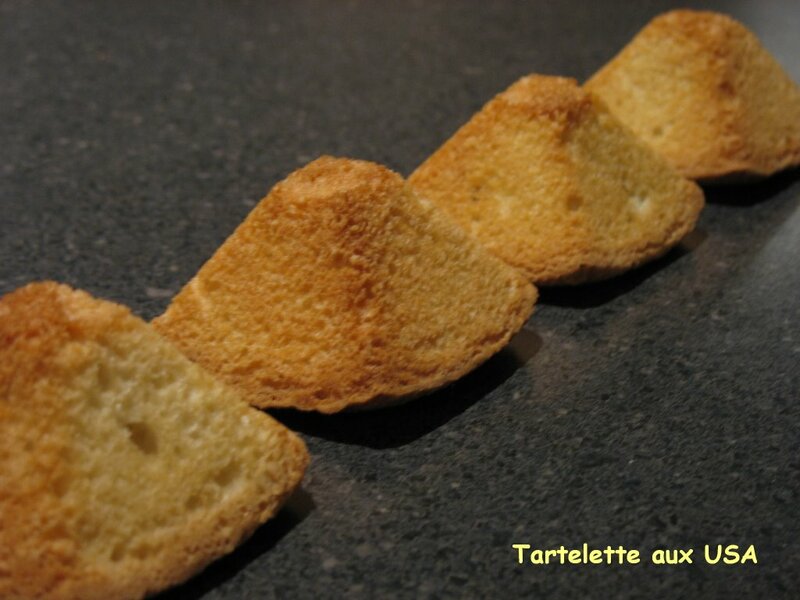 A financier, sometimes called a friand, is a type of pastry in French cuisine. The financier is a light tea cake, similar to sponge cake, and usually contains almond flour, crushed or ground almonds, or almond flavoring. The basis of the cake itself is beurre noisette (brown butter), egg whites, flour, and powdered sugar. 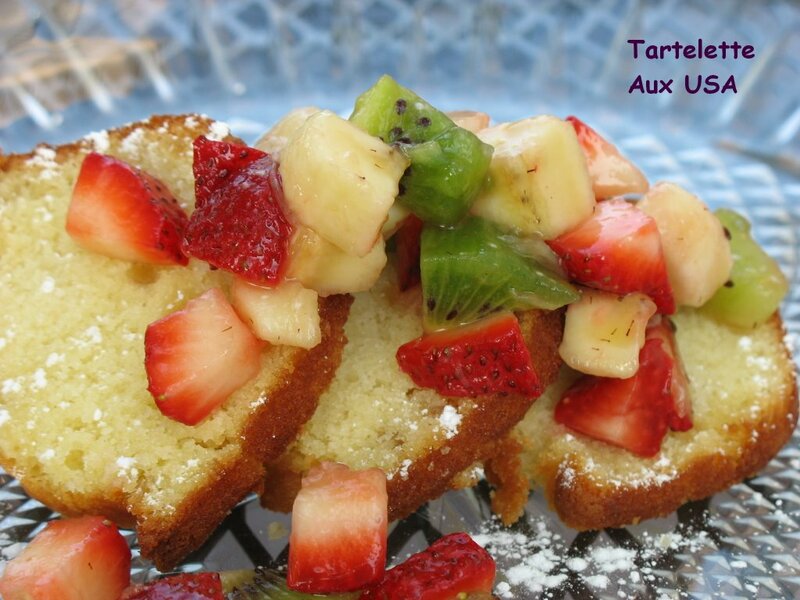 Financiers are often baked in shaped molds. 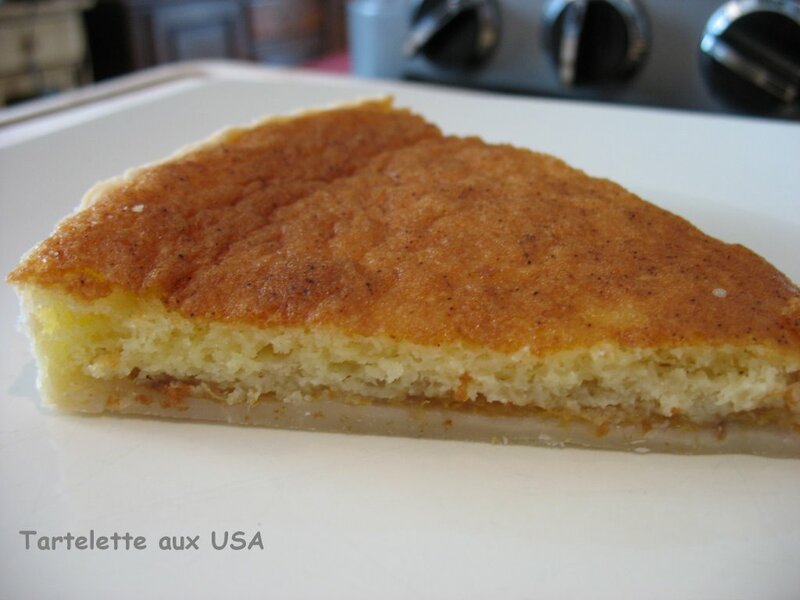 The name "financier" is said to derive from the traditional rectangular mold, which resembles a bar of gold. 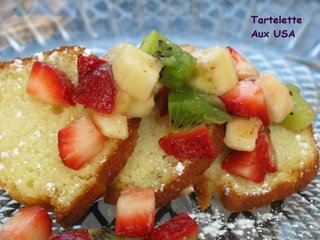 Financiers are often served topped with whipped cream, berries, or other fruit, and served accompanied by ice cream or other frozen confections. Recently, a number of artisanal bakers have begun making non-traditional financiers, using flavorings such as coconut, chocolate, banana, and hazelnut. Financiers are somewhat similar to madeleines. Confectioners' sugar if desiredPreheat your oven to 350F. Grease and flour the insides of 2 12-cavity mini muffin pans. Process the pistachios and 3/8 c of the sugar until very fine. Mix in the flour. Melt the butter, stir in the flavorings and set aside to cool. (I browned the butter as I like the nutty taste.) Beat the egg whites until they hold a soft peak. Add the remaining half of sugar gradually as you continue to beat the egg whites. Stop before the meringue is stiff. Alternately fold in the nut and butter mixtures, stirring after each addition. Use a spoon to fill the cavities of mini muffin pans 3/4 full. Bake for 20 minutes until well risen and golden brown. Cool briefly, unmold, and serve with a dusting of confectioners' sugar if desired. The almonds and the rum made a great combo and out of the 10 that I made using Flexipan pyramid molds, there are only 6 left..don't look at me like that! I do urge you to make these, changing the nuts and liqueur to suit your taste because they are incredibly easy and delicious. The weather is nasty but on the other hand there is the World Cup to keep us occupied...oh yeah I am already losing my voice! Not sure what to make this sunday. There are great recipes I want to try: cookies, gelato, cakes..everything looks so tempting...a trip to the grocery store will help me decide. 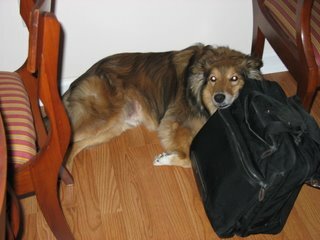 In the meantime here is my #1 fan,Tippy, wishing tomorrow weren't a school day! You can see the WDB round up on Sweetnicks' blog here. A few weeks ago, Cream Puffs referenced Mrs. B's upcoming book release and her need for more recipes testers. I hurried over to her site to see if there were some recipes left to be tested as I wanted to be part of this great recipe book journey. I feel proud and honored that she agreed to have me test her recipe for Coconut Bread, or rather Mama Rose's recipe. Instead of measurement, Mama Roses composes her dough using common sense; if it’s too sticky she adds more flour, if she happens to have extra coconut she’ll throw it in. I, on the other hand, improvise on a fixed recipe that is more or less the base of how I have seen Mama Rose mix her bread. In a large bowl add the instant yeast to the coconut water then add the rest of the liquid ingredients, the sugar and the salt. With a wooden spoon, mix in about1 cup of the flour then add the grated coconut before slowly mixing in the next 4 1/2 cups of the flour 1/2cup at a time; you’ll probably need to abandon the spoon and use your hands after the 4th of 5th cup of flour. Turn the dough onto a lightly floured work surface and knead it while slowly adding the remaining flour as needed to prevent the dough from becoming too sticky. Continue to knead the dough till it is smooth and springy, about 5 minutes. Place the dough in a lightly greased mixing bowl and let rise in a draft free place (a flash heated ovenworks great for this) till it has doubled in bulk, about 1 ½ to 2 hours. Deflate the dough and roll it to fit into two buttered loaf pans. Let the dough rise in the pans until the dough has doubled in bulk again, about 45 minutes. About 25 minutes into the second rise, heat the oven to 375 degrees. Slash a groove about ¼ inch deep, vertically down the tops of the loaves before placing them on the center rack of the oven. Bake for about 40 to 45 minutes or until the loaves are a golden brown.Allow to cool at least 10 minutes before slicing. I did the loaves twice. The first time I went and got 2 coconuts and pierced them to get the water out, and used that instead of regular water, but it was a lot of coconut left over for such an amount needed in the recipe. The second time I used the same amount but used coconut milk instead, as well as the other installment of coconut milk. The coconut flavor was not quite as strong in the first batch, but both times the texture of the bread was incredible. I had to stop myself from eating th whole thing fresh out of the oven. It was close and as good as a brioche but with less butter involved. 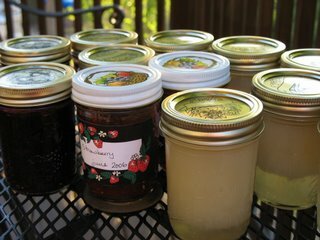 Because of circulation problems in my hands lately I did the first batch using my Kitchen Aid and letting it do the job. The second time I wanted to see how the bread dough would perform in a bread machine and put all the ingredients in my bread machine and set it on the dough program (2 hours) and took it out, separated it into 2 and let it rise another 45 minutes. Worked just as good , though a little longer of a process. This bread is definitely a winner! Sometimes you have to stick to the basics.... Ripe bananas, flour, sugar, vanilla, and voila...the perfect vessel to Coconut Honey Curd. Spoon batter into 4 (5 x 2 1/2-inch) miniature loaf pans coated with cooking spray. Bake at 350° for 45 minutes or until a wooden pick inserted in center comes out clean. Let cool in pans 10 minutes on a wire rack; remove from pans. Let cool completely on wire racks. My variations this time: I used 1/2 cup of buttermilk instead of the milk and sour cream and added 1/2 cup of toasted walnut to the batter. 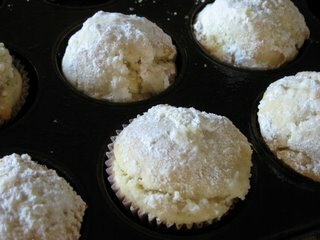 As soon as they came out of the oven I dipped them in melted butter and powdered sugar. Note: can't seem to load a picture tonight, sorry. Well, it was a really productive Monday in our kitchen! I volonteered to test Mrs.B. 's recipe for Coconut Bread and will report on it tomorrow. 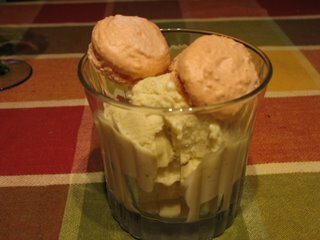 There was also a batch of mini ciabattas, a perfect batch of pink macarons (except that my almond meal was a bit too coarse), and a batch of vanilla ice cream. 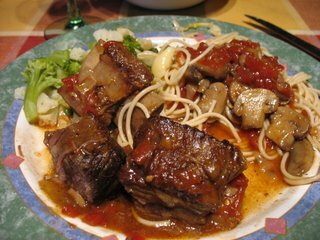 All these are up for upcoming posts, but to show you that we do not live on sweets alone, here is our dinner for tonight: braised beef short ribs, broccoli and cauliflower and gluten free spaghetti, dessert was ice cream and macarons. Allright, nothing new to the recipe for ice cream, it starts with a simple creme anglaise, let it sit in the fridge until completely cold and churn it for 35 minutes. For the recipe I got my inspiration from Dessert First and her Roasted Cinnamon Ice Cream. I used one cup of milk and one cup of cream and no cinnamon, but vanilla sugar instead. It was delicious. I love lemons the same way others love strawberries. I have been playing around in the kitchen today, looking at my kitchen gadgets, my pans, my tools, thinking about what I could come up for a catering job I am hoping to get. 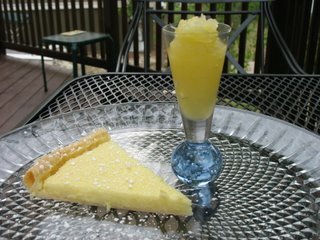 The bowl of lemons was calling my name, and I had one last sheet of pie crust in the fridge. The tiny tarts were tart that's for sure! I might add a dollop of whipped cream next time, but since you only 2 or 3 it's not that bad. In a medium saucepan, bring the lemon juice, zest and sugar to a simmer. In a separate bowl, whisk the egg until yolk and white are well combined. Slowly pour some of the hot lemon juice over the egg and whisk to temper, return the egg/juice mixture to the saucepan and stir constantly over low heat for 5 minutes or until thickened. 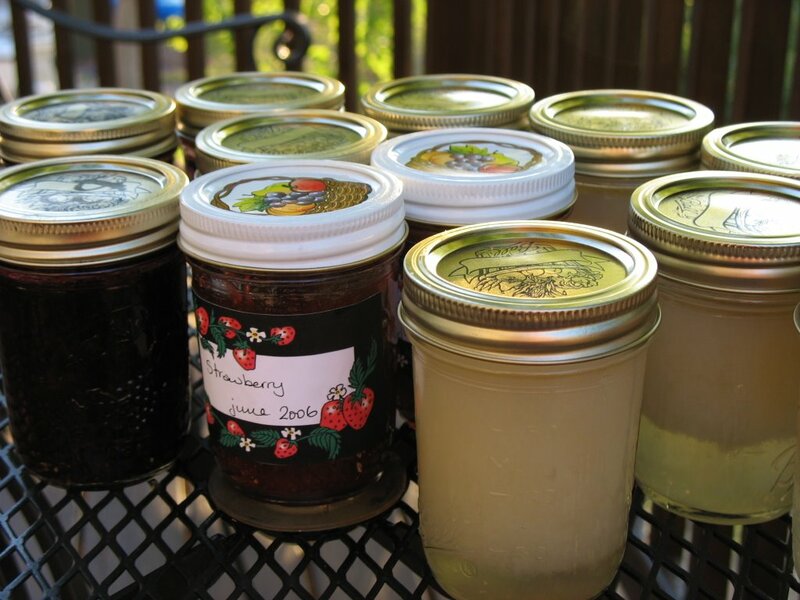 Let cool and cover with plastic wrap before refrigerating. 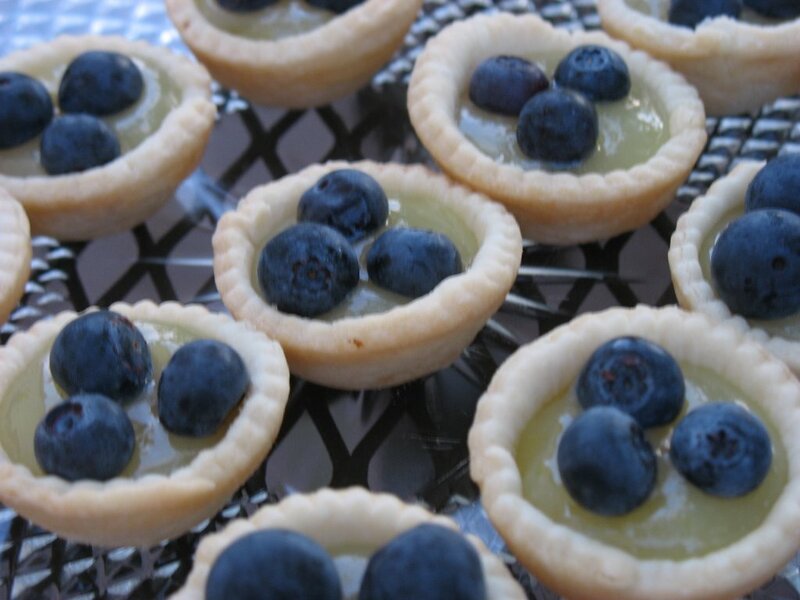 As easy as 1-2-3 and it was enough to fill about 12 mini tarts. I know, everybody's idea of stormy weather food is different. Some stock up on canned items, others cook up everything in the fridge in case they lose power and others like me stare at their pantry long enough to come up with only one thing: chocolate brownies. I did the recipe as it was written except I added 1/4 Kahlua just for some extra flavor. 3. Whisk together flour, baking powder, and salt in a medium bowl; set aside. Put eggs, sugar, and vanilla into the bowl of an electric mixer fitted with the whisk attachment. Beat until pale, about 4 minutes. Beat in chocolate mixture. Add kahlua or coffee if using. Add flour mixture; beat until just combined, scraping down sides of bowl as needed. Well, limes and pineapples were on sale at the store this morning so here we are, another citrus creation. The lime mixture is quite tart so eating a piece of pie with a cool spoon of pineapple sorbet mellows the whole thing and brings in a tropical flair. 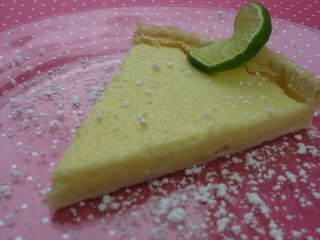 For the lime pie recipe I got inspired by two favorite bloggers of mine, Cream Puffs in Venice and Cindy's Kitchen. I cheated though I did not feel like making a crust so I used store bought and pre baked it. For the pineapple sorbet: dissolve 200 grammes of sugar in 150 ml. of water on medium high heat. Cool the syrup a bit and puree 800 grammes of pineapple along with the cooled down syrup. Put in a ice cream maker and then the freezer. - 1/2 cup heavy cream. Mix the eggs and sugar until pale. Add lime juice and zest, then the creams. Pour into pie shell and bake at 350 for about 20 minutes. Testing to be held tonight. Update: Mr.B said the tart was really puckery and he loved the sorbet to mellow it. Note on a different topic: we headed down to Hilton Head for the day yesterday and did the Rachel Ray $4o a day thing, by having drinks at the Old Fort Pub overlooking the water. Romantic to the end...! 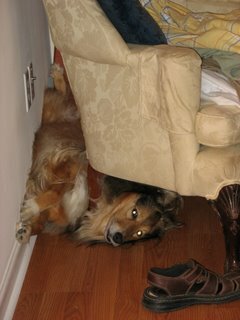 My first participation to Weekend Dog Blogging over at Sweetnicks. OK... so I completely missed SGHF, but this is still enough summer looking to be added early June, even if it is a pound cake...triple ginger nonetheless. I have not been able to write anything at all last week. Did some baking but not much either, for some reason I kept being interrupted by job - related issues...how dare they? 1. Heat oven to 400°. On a lightly floured surface, roll pâte sucrée into a 14-inch circle. Fit pastry into an 11-inch tart pan; trim dough evenly along edges. Use trimmings to patch any thin spots in shell. Refrigerate 30 minutes. Meanwhile, in a large bowl, whisk eggs, sugar, and bourbon until combined. 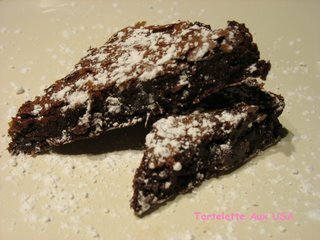 Whisk in flour, salt, and butter; stir in chocolate. Pour mixture into chilled tart shell. Cover top with nuts, pressing them halfway down into filling.